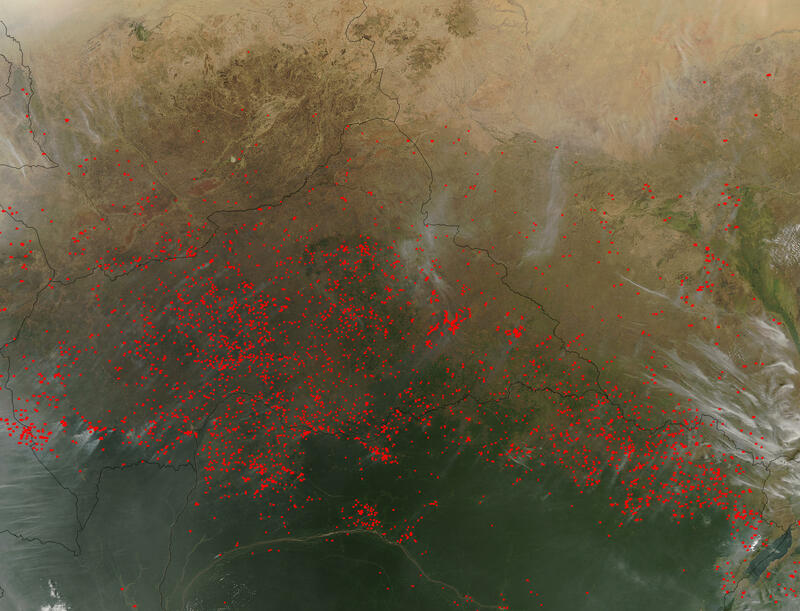 The Moderate Resolution Imaging Spectroradiometer (MODIS) flying on board the Aqua satellite detected hundreds of fires (red dots) in Central Africa on February 6, 2004. Many of these fires were likely started by farmers clearing their land. Biomass burning is a common agricultural practice worldwide. Indeed, in the lower half of the image, many fires are burning in or near brown areas of cleared land, not directly in the green forested area. This image also provides a view of Africa’s three biomes: the vast Sahara Desert in the north, the Savanna grasslands in the center, and the lush, densely vegetated tropical rainforest in the heart of Africa. The three regions are distinguished by their colors in this image. With relatively little vegetation, the desert is tan. The African Savanna, made up of grass and scattered trees, is light green and tan. In the bottom of the image, the rainforest appears dark green. The Congo River cuts across the forest from the left side of the image. In the bottom right corner is Lake Albert, and running vertically along the right edge of the image is the White Nile River. Going counter-clockwise from the top right corner, the countries shown in this image include Sudan, Chad, Cameroon, Nigeria, Congo, Central African Republic, Democratic Republic of the Congo, and Uganda.